NEW ORLEANS, Louisiana — (August 22, 2018) Stirling Properties commercial real estate company is pleased to announce that True Food Kitchen will be the anchor tenant in The Julia at Saint Charles, an upcoming mixed-use development in New Orleans’ Warehouse District. This marks the first Louisiana location for the Arizona-based restaurant brand. True Food Kitchen is a health-driven, seasonal restaurant merging nutrient-rich ingredients with a flavor-forward menu that rotates regularly to let guests experience great tasting food and thoughtfully crafted beverages—shared in an environment of infectious positivity. Founded by a passionate collective of accomplished chefs, visionary restauranteurs and a renowned doctor of integrated medicine, the restaurant brand is rooted in a belief that delicious dining and conscious nutrition can go hand-in-hand, without sacrificing flavor, creativity or indulgence. Its menu caters to nearly every food preference with a variant of gluten-free, naturally organic, vegetarian and vegan offerings. Founded in 2008, True Food Kitchen currently has 23 locations in 10 states including California, Texas, Arizona, Georgia, Florida, Colorado, Illinois, Maryland, Virginia and Pennsylvania. The restaurant brand plans to double the number of restaurants it operates over the next three years. 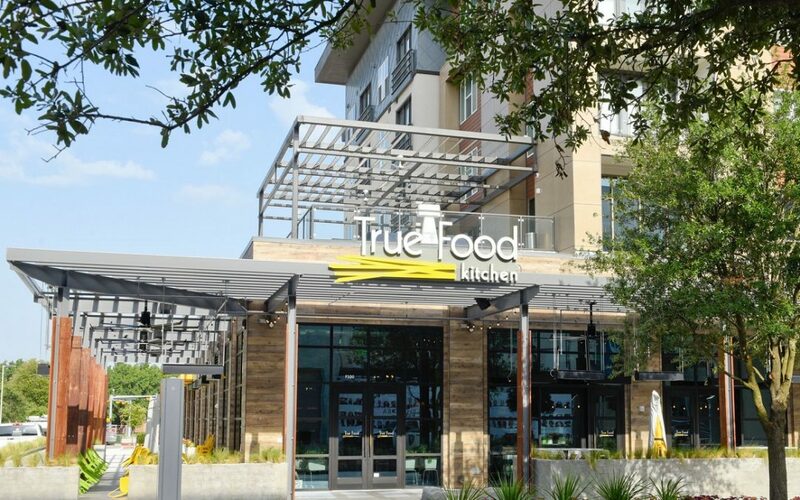 True Food Kitchen in New Orleans will occupy over 6,000 square feet of space in addition to a 2,000 square foot outdoor patio located on the corner of Julia Street and St. Charles Avenue. It is expected to open in the summer of 2019. The Julia at Saint Charles will feature over 16,000 square feet of ground floor commercial space including an exciting mix of local, national, and international retail tenants. In addition to the commercial area, the project comprises almost 200 luxury apartments and enclosed parking facility, which will be available to both the residents and public. Construction is underway, and suite delivery is slated for the 4th Quarter of 2018. The development is set to open in the 2nd Quarter of 2019. Joe Gardner, CCIM and Carly Plotkin, Sales & Leasing Executives with Stirling Properties, are the listing agents for the retail portion of the property, along with Stuart Zall and Gerardo Aguinis with The Zall Company. John Middleton of MJK Advisors represented the tenant. The project is being developed by Audubon Capital Partners of Boston, MA and Woodward Design + Build. For commercial leasing information, contact Joe Gardner, CCIM at jgardner@stirlingprop.com / (504) 620-8140 or Carly Plotkin at cplotkin@stirlingprop.com / (504) 620-8120. Stirling Properties is one of the most diversified full-service commercial real estate companies in the country. Regionally focused and nationally acclaimed, we specialize in Brokerage Services, Asset & Property Management, Development & Redevelopment, and Investments over a wide array of property types across the Gulf South region of Louisiana, Mississippi, Alabama, and Florida Panhandle. Connect with Stirling Properties on the web at www.stirlingproperties.com, “like” us on facebook.com/stirlingproperties, follow us @StirlingProp on twitter.com/StirlingProp or subscribe to our Stirling Insights blog. Founded in Phoenix, Arizona, in 2008, True Food Kitchen is a restaurant and lifestyle brand inspired by the philosophy that food should make you feel better, not worse, and that great tasting food and thoughtfully crafted beverages can serve as the foundation for a life well lived. The restaurant brand is driven by a passionate collective of accomplished chefs, visionary restauranteurs, and a renowned doctor of integrative medicine – who believe delicious dining and conscious nutrition can go hand in hand, without sacrificing flavor, creativity, or indulgence. True Food’s seasonal menu is guided by the principles of Dr. Andrew Weil’s anti-inflammatory food pyramid. True Food Kitchen emphasizes wholesome, simple ingredients with simple preparations to highlight the natural health benefits and flavors of each ingredient. From nutrient-dense staples and carefully sourced proteins to little-known superfoods, True Food Kitchen is committed to sourcing the most responsible, creative, freshest, in-season ingredients. True Food Kitchen has 23 locations in 10 states: including Arizona, California, Colorado, Florida, Georgia, Illinois, Maryland, Pennsylvania, Texas, and Virginia, with plans for additional locations throughout the U.S. in the coming year. To learn more, visit www.truefoodkitchen.com.